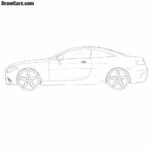 In this drawing instruction, the team of DrawCars will show you how to draw an Audi A7 very easy and quick. In our opinion, this car is one of the most beautiful of its kind. Flawless execution of the exterior and details will not leave indifferent even the indifferent person. In the first stage, using coarse lines we create the body of our four-door Audi A7 sports coupe. As you can see, this is a fairly flat and long car. Note that these are just auxiliary lines that should not be too dark. In this stage we are adding several details to the Audi A7. 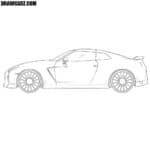 So, here we have to depict the headlights, large circle wheels and mirrors using rough lines. Now let’s detail the body of our four-door Audi A7 coupe. We will depicture the details from left to right. That is, in this step we will depicture the headlights of the Audi, its bumper and hood lines. The Audi A7 is distinguished by its dynamic design and a fairly flat roof, which we will draw in this step. So here we depict the flat roof and the windows. Mirrors are also should be drawn in this fourth step. A rather simple step of the instruction on how to sketch an Audi A7. Here we will only need to depicture the outlines of stylish taillights and rear bumper. Let’s now get into the details on the body of our Audi A7. 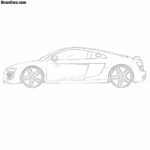 Add wide doors, handles and horizontal lines on the body of the Audi. With the help of an eraser delete all auxiliary lines from the Audi. Now it’s time for the tires and rims of the Audi A7. In order to draw the rims correctly, first sketch the central part, then the spokes, which extend from the center to the edges. It remains to darken some parts of the car with hatching. Shadows will make your Audi realistic and voluminous. If you did everything correctly, then you will get such a cool Audi A7. 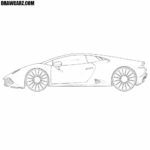 The team of Draw Carz hopes the drawing instruction about how to draw an Audi A7 was helpful for you. By the way, article will be a very good tool if you are thinking to design an Audi S7 and Audi RS7 sportback. 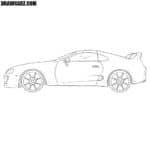 In addition, A7 is very similar to the Audi A5 Sportback, so using this drawing instruction you can depict this car too. Also, we recommend to look for similar lessons of Drawcarz.com. 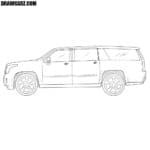 © 2018 - 2019 DrawCarz - How to Draw Cars. 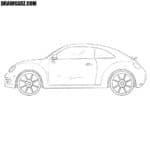 For cooperation, contact us by email: [email protected] On our site you will find a huge number of drawing lessons about a variety of cars, from the most simple and budget cars, to the most expensive and luxury cars. We show the process of drawing cars in the smallest detail. For this, we divide all our lessons on a large number of short steps, in order to make it easier for our readers to understand the process of drawing cars. 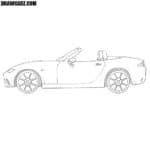 In addition to drawing cars, you can find car reviews and car insurance information on our site. To find out more about car insurance, please contact us by email.